According to the American Red Cross, most home fires start in the kitchen. Even a small kitchen fire that does not spread into the rest of your home can cause a significant amount of smoke damage to your kitchen cabinets. Should you reface or replace them? 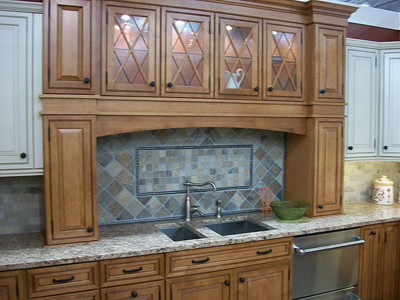 If there is no structural damage to your kitchen cabinets, you may be able to have them refaced. In this process, a carpenter will remove the cabinet doors, sand them down to remove the smoke damaged finish, make minor repairs, then refinish and repaint them. The carpenter will do the same for the frame. If more significant smoke damage restoration is required, you may prefer to replace your cabinets after a kitchen fire. This is a more expensive option, because the contractor will need to bring in a smoke damage cleanup crew to remove the old cabinets before the new ones can be installed. Refacing smoke damaged kitchen cabinets can be a more cost-effective solution than replacement, depending on how intricate your cabinet doors are and whether you need to hire an expert, or if your local carpenter can handle the job. If you live in a historic home and the cabinets are original to the house, a wood furniture restoration expert is the best choice. If your cabinets are fairly simple and do not hold historic significance, a typical carpenter can do the job for a much lower rate. After a kitchen fire, you want your home to be restored to normal as quickly as possible, but hiring the first wood furniture refinishing company or kitchen contractor you find may actually delay the project and cause extra stress. Take the time you need to interview several service providers, preferably in your home so they can survey the damage and give you the most accurate estimate possible. Always ask for references from current and recent clients, and take the time to speak to a few of them. Choose the service provider who offers the best combination of expertise and experience in smoke damage restoration for your budget.